We’d love your help. Let us know what’s wrong with this preview of Equal Opportunity Hero by Phil Price. Patterson grew up during a time of American social unrest, protest, and upheaval, an On April 7, 1984, T. J. Patterson became the first African American elected to the Lubbock City Council, winning handily over his four opponents. It was a position he would go on to hold for more than twenty years, and his natural leadership would lead him to state and national recognition. To ask other readers questions about Equal Opportunity Hero, please sign up. Congressman Randy Neugebauer said in 2004 that T.J. Patterson is a man of many firsts. Patterson had his pulse on the black community and where there was a need, he stepped-up and helped meet it. Whether it was forming a black community newspaper (the Southwest Digest that is to this day still running strong), serving in local or state government and on committees (usually as the first black to do so), or doing outreach work for his church, Patterson lives it as he says it: "We shouldn’t wait around for other people to do what we should do ourselves." To Patterson, it all boils down to the importance of family & community. I enjoyed reading about his family dynamics and attitudes on discipline and respect - and loving parental discipline. Of Patterson's view on parenting, Price says Patterson believes, "children need a strong and steady adult hand in their raising, a hand that extends to their back side sometimes." Whatever Patterson and his wife did was successful, as his three children all lead lives steeped in service to their communities as public servants and active church members - and daughter Shelia has made things come full circle by occupying her father's old seat on the Lubbock City Council. Significant portions of the book are about people other than Patterson, but who were integral to his life, including family members, his friend and business partner Eddie Richardson, and numerous community and political figures. Again, all the information presented is in context of the bigger picture of what was happening in our nation and world regarding civil rights movements. Author Phil Price enlightens the readers, presenting Lubbock and West Texas black history lessons I would venture to say most have never learned. Price’s writing is immaculate and the book is cleanly edited, so there is nothing to interfere with the enjoyment of the book. The foreword, written by T.J. Patterson himself, is excellent in providing perspective to the rest of the book. Additionally, mid-point in the book, there is a wonderful selection of photos, and finishing out the book are end notes (organized by chapter) and an index, both which make it easy for the reader to navigate the book. I highly recommend Equal Opportunity Hero not only for anyone who’s lived in or been to Lubbock, but for a wider audience of readers who want to see a model of a life well-lived, a life of “solutions and action, not rhetoric,” and a truly remarkable man. Equal Opportunity Hero is about T.J. Patterson, the first African American elected to the Lubbock City Council, but this story is actually about so much more. Patterson grew up in segregated Texas and experienced the turmoil and violence of desegregation. Patterson also survived childhood polio, Vietnam, and countless other battles throughout his life. What it takes to make a city thrive and survive shines through in this story about a humble man who loves God, his family, and Lubbock. As Phil Pr Equal Opportunity Hero is about T.J. Patterson, the first African American elected to the Lubbock City Council, but this story is actually about so much more. Patterson grew up in segregated Texas and experienced the turmoil and violence of desegregation. Patterson also survived childhood polio, Vietnam, and countless other battles throughout his life. What it takes to make a city thrive and survive shines through in this story about a humble man who loves God, his family, and Lubbock. As Phil Price eloquently presents, individual stories in our history are not only about individuals. People like Patterson do not live in a vacuum, and Equal Opportunity Hero shows that it takes many people working together to make a city great, fair, inclusive, and a wonderful place to live. Phil Price expertly weaves these other people’s stories into the overall story about T.J. Patterson, building the picture of this notable man linked with so many other notable people. For me, the best part of this story is Patterson’s personal life that includes his drive to make Lubbock a better and more equal place, the conviction of God’s will and mercy, the blessings of a loving family and true friendships, and the opportunity (and ability to seize that opportunity) to make a difference. But wait! There’s more. This article includes a little video that will allow you to see and hear T.J. and feel the respect he has for Lubbock and the respect Lubbock has for both him and his daughter, Shelia. With Phil Price mentioning T.J.’s charismatic voice throughout Equal Opportunity Hero, I just had to hear it for myself. 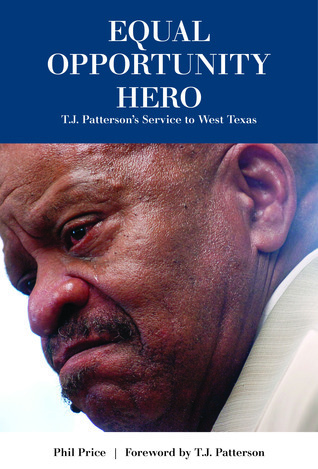 While Equal Opportunity Hero sheds light on T.J. Patterson and all he has done for Lubbock, Texas, it also reminds us that there are many such hidden gems in this great state of Texas. So many people have made a difference, and I want to thank Phil Price personally for highlighting and celebrating the life and contributions of a truly remarkable man: Thomas James (T.J.) Patterson. As someone who isn't native to Texas, I always enjoy learning more about the people who helped to form the the state, or who were instrumental in its politics and culture over the decades. T.J. Patterson is one of the latter, and the author, his friend Phil Price, paints a picture of him that is vibrant and interesting, but also extremely real. I appreciated that this biography was not a dry academic treatise, but a real glimpse into Patterson's life, from his time at Bishop College (a black coll As someone who isn't native to Texas, I always enjoy learning more about the people who helped to form the the state, or who were instrumental in its politics and culture over the decades. T.J. Patterson is one of the latter, and the author, his friend Phil Price, paints a picture of him that is vibrant and interesting, but also extremely real. I appreciated that this biography was not a dry academic treatise, but a real glimpse into Patterson's life, from his time at Bishop College (a black college) and beyond, Price shows him to be intelligent, witty, and somewhat self-deprecating, but also extremely self-aware. Patterson is quoted extensively, to the point where it almost feels like his own voice outshines that of author Price, but maybe that's how it should be. After all a biographer's job is not to take the spotlight, but to put their subject in it. And in this book Patterson shines, not only in the glow of his own achievements but in the obvious affection and respect the author has for him. As the child of activists, and someone who has been involved in her own causes since the age of twelve - not all the same causes, of course - I understand what it is to stand for the things you believe in, and I came away from this book knowing more about Texas, about how the civil rights movement was received in Texas, and about a fundamental player in recent Texas history.